LONDON--(BUSINESS WIRE)--Technavio has announced the release of their research report on the global tunable laser analyzer (TDLA) market for the forecast period 2019-2023. This global tunable diode laser analyzer market analysis report segments the market by type (in-situ and extractive) and geography (APAC, Europe, MEA, North America, and South America). Global tunable diode laser analyzer market size will grow by USD 211.38 million during 2019-2023, at a CAGR of about 8%. Portable tunable diode analyzer systems are easy to install and operate. Their small size and portability make the measurement operation easy even in confined areas. Portable gas analyzers are increasingly used in oil and petroleum refineries and mining sites. They work flawlessly in real-time environments for the detection of specific components in the surrounding area. The increasing demand for portable analyzers has encouraged many vendors to launch advanced products in the market. For instance, AMETEK’s 5100P portable TDLA is specifically designed for measuring H2O concentration in natural gas pipelines as well as processing and fuel lines. The technology eliminates the need for routine calibrations, frequent maintenance and increases the measurement uptime. The trend of adopting portable TDLAs is expected to increase during the forecast period, driving the growth of the global tunable laser analyzer market. SCR technology is widely used in the DeNOX systems backed with TDLAs. Such systems are mostly used in coal-fired thermal power plants because of high flue gas emissions. The integration of SCR technology with DeNOX systems improves environmental conditions and improves overall site safety. Rapid urbanization and developments in various industries are increasing power consumption. This is increasing the demand for DeNOX systems and will drive the adoption of TDLAs. Recently, MITSUBISHI HITACHI POWER SYSTEMS received an order from the Taiwan Power Company for the delivery of low-NOx combustors. The order also includes the upgradation of seven gas turbines as well as the supply of spare components. The increasing implementation of SCR technology among many such thermal power plants will drive the growth of the global tunable diode analyzer market. “The APAC region has many semiconductor manufacturing plants located in countries like China, Taiwan, and South Korea. Semiconductor plants use TDLAs for measuring and monitoring the impurities present in nitrogen trifluoride gas, which is used for cleaning process chambers. Also, the construction of new cement manufacturing factories in the region will increase the demand for TDLAs. The presence of oil and gas, petrochemical and semiconductor manufacturing plants in the North American region will contribute to the growth in demand for TDLAs. North America is one of the top producers of petroleum and natural gas, and the US dominates crude oil production in the region. These factors will collectively contribute to the growth of the global tunable diode analyzer market over the forecast period”, says an analyst at Technavio. 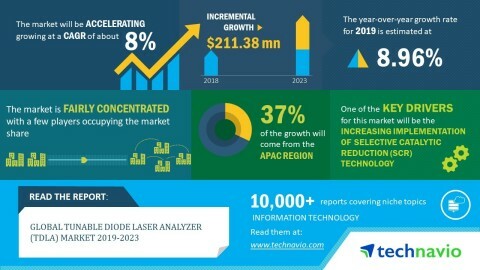 Technavio has announced the release of their research report on the global tunable laser analyzer (TDLA) market for the forecast period 2019-2023.